As a new official at the Kanpur Electricity Supply Co. in 2011, Ritu Maheshwari installed new meters across almost a third of the companys customer base. Until recently, Ritu Maheshwari was spearheading efforts to turnaround cash-strapped state utilities. 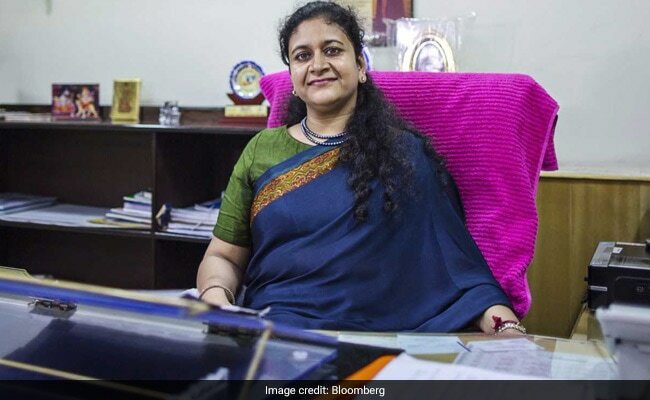 Ritu Maheshwari learned quickly how recovering part of the $10 billion or Rs 64,000 crore a year of electricity stolen across India could be a career-limiting move for a young, female bureaucrat. As a newly minted official at the Kanpur Electricity Supply Co. in 2011, Ms Maheshwari installed new meters across almost a third of the company's customer base. The devices recorded energy consumption digitally and exposed real-time leaks in the distribution system. But so deeply ran the interests protecting power-pilfering in Kanpur, an industrial city 311 miles southeast of Delhi, that she was transferred after 11 months. Six years on, the 39-year-old's battle with corruption and misogyny - told internationally in a 2014 Bollywood film called Katiyabaaz - is highlighting the need for technology that thwarts illegally tapped power connections. Until recently, Ms Maheshwari was spearheading Prime Minister Narendra Modi's efforts to turnaround cash-strapped state utilities in a bid to ensure continuous supply of power to millions of households, farms and factories. The plan that Ms Maheshwari ran, known as UDAY, cut the combined financial losses of states that signed up for the reform to Rs 40,295 crore in the year to March 31, about 22 per cent lower than the previous year, according to the power ministry. "I managed to change 160,000 meters of 500,000 amid protests from pilfering consumers that drastically brought down the city's distribution losses, which were at 30 percent then," she said in an interview in Delhi. "People thought I could be fooled or manipulated, because what would a woman know about electricity and complex grids?" said Ms Maheshwari, who graduated from the Punjab Engineering College in 2000, and joined the Indian Administrative Service three years later. "Staff members at different levels were not happy with the kind of measures being taken, whether it was metering or raids on theft. Insiders passed on information." Her strategy worked. Losses at the Kanpur Electricity Supply Co., or Kesco, have since halved to 15.6 percent, data on the power ministry's website show. Some retailers, including firms in Delhi and Mumbai, have also found that technology can curb theft and improve billing and payment-collection efficiency to minimize losses. That's leading to a steady upgrade of power grids with hi-tech meters, transformers, automation and new wiring supplied by companies such as Schneider Electric SE, Landis+Gyr Group AG, and Nokia Oyj. India's government is envisaging about $50 billion of investment opportunities in the power transmission and distribution industries in the five years through 2019, according to Piyush Goyal, who was the country's power minister until Sept. 3. "One of the state utilities recently told me that their transmission and commercial losses in rural areas were 25-to-30 percent, and if they can reduce it by 1 percent they can save 185 crore rupees," said Prakash Chandraker, vice president and managing director of the French electrical equipment maker's Indian unit's energy business, in an interview. Tata Power Delhi Distribution Ltd., a power retailer in Delhi, partnered a local arm of Finland's Nokia earlier this year to support the management of its electrical grid in the city's north and northwest. The move is set to reduce outages by 60 percent in a year, said Satya Gupta, the electricity retailer's head of information technology. The company will install 250,000 smart meters over a year starting March 2018 and expand installations to 1.8 million households by 2025. Even bigger opportunities exist in states like Uttar Pradesh, the country's most-populous, where losses average about 35 percent for distribution companies. More than 75 percent of households in Uttar Pradesh are in rural areas. There, 8.4 million of the state's 29 million rural households receive non-metered electricity access, while 11.2 million are without any power, government data show. India issued its first tender to buy 5 million smart meters in Uttar Pradesh and neighboring Haryana state on August 1. Energy Efficiency Services Ltd., the government agency responsible for running the country's energy efficiency programs will conduct an international competitive bidding process to procure the equipment. "This is a pilot project where 4 million smart meters will go to Uttar Pradesh and the rest to Haryana," said Saurabh Kumar, the agency's managing director, in a phone interview. If successful, it will be rolled out across many more states as part of a program to support distribution companies, he added. Until July, Ms Maheshwari headed that program, which aims to use technology, among other measures, to lower so-called aggregate technical and commercial losses to an average of 15 percent by 2019, and improve the viability of power retailers. Last week, she took on a new job as a district magistrate in a Delhi suburb. "The next two years will be very crucial as several states need to move from poor metering to smart metering," she said.